Walk in the park of shame. Billy Stewart wants to know if I am ready to accept Jesus Christ into my heart. Every Saturday morning in Balboa Park, Stewart sets up a neatly arranged table with a multitude of biblical tracts. This particular Saturday, Stewart is accompanied by a toothless gentleman. I overhear him disclose to a tourist that he was blind, deaf, and dumb before Jesus healed him. A banner behind Stewart’s table proclaims in ominous crimson letters, “Jesus Christ Is Lord, Not a Swear Word!” Another, much larger sign states: “A.. ‘Blood Donor’.. Saved My Life His Name Is ‘JESUS’” And He Is Waiting & Wanting To Save Yours!” I am too distracted by the layout of the sign, its lack of punctuation and bizarre use of quotation marks, to take in what Stewart intended to convey. Air quotes come to mind. As a result, when I read the words “Jesus” and “Blood Donor,” they come out dripping in sarcasm. Stewart is among a growing group of Balboa Park evangelists. They are drawn by the park’s heavy foot traffic and mix of local and out-of-town visitors. The day I visit the park, there are three other evangelical Christian groups handing out fliers or brandishing signs asking park goers to repent or to trust Jesus. Nearby, a group of Hare Krishnas hand out the Bhagavad Gita in exchange for a donation. Not far from them, the atheists under a shade tent offer humanist literature. A few feet away, a pagan woman offers palm readings, also in exchange for donations, and near the Reuben H. Fleet Science Center, Jehovah’s Witnesses have a folding book case holding multilanguage religious booklets. “We used to set up down there, where they are now,” Billy says pointing down the Prado to a spot in front of the House of Hospitality. Statistics like those are what drive Stewart to continue street evangelization. He has four adult children. “One out of four is saved. I have three that are in the world and of the world. They think that [their] Daddy is a little kooky, but that’s fine. I don’t preach to them. My witness to them is my walk. It’s a parent’s greatest nightmare to see his own flesh and blood not walking with the Lord,” He says with a deep sigh. Stewart makes an effort to talk to all the other religious groups in the park about Christ. His wife rolls her eyes so hard that I can almost hear them rolling back in her head. She is not amused. Two atheists wearing bow-ties are playing chess at a small card table. One of them is holding a black umbrella as protection from the blazing hot sun. Hung on the front of their table is a banner that reads, “Ask an atheist, you might like the answer.” Nearby, another table is manned by four men. They are having an in-depth conversation with a couple of pretty teenaged girls. The girls, who are dressed in matching pink T-shirts and yoga pants, attend a local Catholic girls’ school. They are arguing over the existence of Jesus. A smile spreads across one of the atheists’ faces as he encourages the young women to question what they have been fed. The teens appear exasperated. A thick balding man wearing Blublockers jogs past. He slows down in front of the booth and shouts, “Way to go, guys! Way to represent nothing!” His voice is thick with hostility. Rob Hudson, an older man with a gray ponytail and a thick unruly beard, shrugs. Clearly he is accustomed to that kind of behavior. “We get a lot of people that seriously want to save our souls, people that want to pray for us. Someone will walk by and say, ‘I’ll pray for you,’ and I’ll say back, ‘I’m going to think for you.’ One person told me not to bother. I thought that was a little sad,” says Hudson. Not long ago, a Christian man, distressed after coming across the atheist group in the park, offered a hundred dollars to any group member who would attend church with him. James Hutson, a balding young man in his late 20s who is so pale that he is nearly translucent, took the bait. The walk of shame through Balboa Park. Statistics back up the idea that atheists’ knowledge on religion often surpasses that of the non-secular sect. A religious knowledge survey conducted by Pew Research in 2010 found that atheists and agnostics in the United States outperformed evangelical Protestants, mainline Protestants, and Catholics on questions about the core teachings of major world religions. Atheists scored the highest, followed by Jews and Mormons. Mainline Protestants and Catholics came in at the bottom of the list. A short tour of the selection of evangelists who congregate on El Prado, in Balboa Park, San Diego to engage with passers-by. Tommy’s answer is a little different. He starts to say more but his voice is drowned out by a man nearby who is dressed in head-to-toe black. The man is kneeling on the ground in front of the fountain adjacent to the Timken Museum. 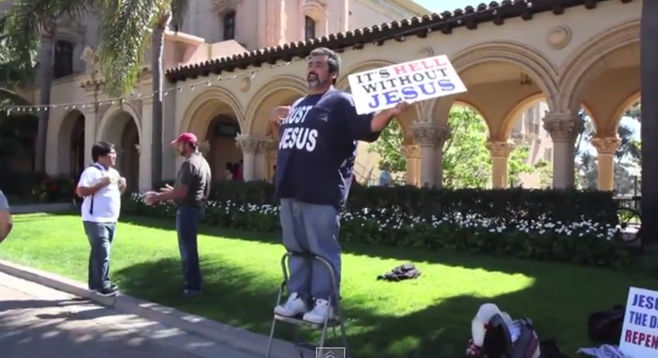 He is holding a Bible in one hand while shouting out a lengthy Scripture passage. A woman and her young son rush past him. The mother looks terrified. Tommy leans in closer so I can hear him over the Scripture reading. Tommy and Hutson walk me over to the sidewalk preacher for an introduction. He is preaching so loudly on the topic of circumcision that my ears ring. Meanwhile, to my right, a middle-aged man poses in front of the preacher. He sticks his thumb up in the air as his friend snaps a photo. The preacher doesn’t notice. He is immersed in his reading. When he finally comes to a stopping point, Tommy says, “Excuse me, Paul, I would like to introduce you to someone.” I am relieved to discover that Paul’s conversational tone is much quieter than his Bible-reading one. Miles Livingston is Paul’s given name, but he would like to be referred to as Paul the Prophet. Livingston’s Christian message differs from Billy Stewart’s. His message isn’t as urgent. He isn’t trying to convince me of anything. Livingston is very matter-of-fact. And his message is much more doom-and-gloom. Livingston’s reasoning for the last statement is based on the idea that Obama has read all seven Harry Potter books, “It is witchcraft which is evil and God hates it!” Livingston says. After Livingston reads me a lengthy Bible verse on sin, I ask him if it’s hard to live as a prophet. For the first time, Livingston appears vulnerable and more down to earth. The woman is visiting from India. Her daughter lives in San Diego. The woman launches into a lengthy description of her Hindu faith. “Christian religions are incapable of grasping the idea of reincarnation because Christianity is too dogmatic. You see, there is not just one birth but many...” by now she is fired up and speaking quickly. A balding man who has stopped to listen engages her in conversation. I continue on my way. Near the butterfly garden, I find two men sitting leisurely on folding chairs. They have a wheeled traveling bookshelf situated next to them. It is set up off the main throughway. The gentlemen, who appear to be in their late 60s, or early 70s, wear matching powder-blue button-downs, ties, and beige fedoras. The location of their seats offers them little to no foot traffic. Above their grouping of fliers, it says, “What does the Bible really teach? Free Bible literature published in over 300 languages. Take a copy. Ask for your language.” I thumb through a couple of different pieces of literature. Neither of the men acknowledges me. “Are you Jehovah’s Witnesses?” I ask. The man sitting closest to me nods politely. I wait for a moment, anticipating a long monologue on their beliefs. I am surprised when I don’t get one. The two men look bored. Their method of evangelizing is hands-off. I place the pamphlet in my purse and move on. Back on El Prado, Miles Livingston’s voice booms over the sound of three Hare Krishna monks playing bongos on the grass under a brown canopy. Their pale orange robes shine in the late-afternoon sun. Bhakta Larry, a young man with a traditional Krishna haircut, is sitting behind a table. On display are numerous books for purchase. Larry offers me a cookie. He is wearing white-rimmed sunglasses and a thin paisley printed scarf around his neck. I can barely hear him over Livingston’s preaching. “We come out every Saturday just to share the love and spread the transcendental knowledge,” he tells me with a smile so bright it should be featured in a toothpaste commercial. Bhakta Larry says one of the keys to spreading the love is handing out cookies. “We hand out cookies and people are happy, even the atheists. The atheists set up across from us once and we just gave them cookies to make them happy,” he says simply. Bhakta Larry stresses that the Krishnas don’t come to Balboa Park to drum up converts. “It’s about sharing the truth. Truth is universal. The knowledge from the Bhagavad Gita gives us the purpose of human existence. Every step is like a…” he stops mid-sentence. He is distracted by a pretty girl with long wavy brown hair. She comes over to say good bye. She has been playing bongos under the canopy with the Krishna monks. The young lady wears a tie-dye with a marijuana leaf in the center. March 28, 2014 @ 12:12 p.m. I will never understand why the most ignorant of us try and force feed the rest their view. I know religion is basically for "Do unto others as you would hope they do" but therapy and college for those extreme immaculate views would serve better. Scary stuff. March 31, 2014 @ 2:30 p.m.
April 6, 2014 @ 2:59 p.m. So I am not quite sure why describing James Hutson as "nearly translucent" has a bearing on his thoughts, which are laudable, and seem to be well grounded in a humanistic approach. Also left wondering if the author ever thought to find out how the evangelists rate the various other world religions when it comes to validity. Has no one in that camp begun to understand the "toleration' approach to faith? It was a tenent of our Christian Pilgrim forefathers, and mothers-as they knew exactly what intolerance and inflexibility lead to. Much of what is still on display in theocratic states, and is the root of terrorism around the world. It seems it would have been a valid question to pose--if one wants to illuminate a mindset. Hare Krishnas handing out cookies is great, so is Catholics who are feeding and clothing the poor and hungry, and anyone who is living their own exemplary life. Brow beating others, no matter the religion of choice, smells too much like the Inquisition of the Middle Ages, and would seem a lazy man's (or woman's) way to "win" someone over. Or is this all about people who need attention, and control? They seem to me to be valid questions worthy of journalistic attention, rather than random and irrelevant physical descriptions. April 6, 2014 @ 5:12 p.m. There was nothing in the article about Hare Krishnas "handing out cookies." The last time I saw any of them (at an airport sometime back), they were proselytizing and money-begging, and that was quite annoying. May 12, 2014 @ 12:21 p.m.
Are YOU ready to accept the Flying Spaghetti Monster into YOUR heart?